July 20, 2010: Carlson said Rev. Jeremiah Wright was the “one story” that could’ve destroyed Obama and compared Wright to a Grand Dragon of the Ku Klux Klan. Carlson told Fox’s Sean Hannity that the ABC News story that revealed that sermons of Obama’s pastor, Rev. Jeremiah Wright, included incendiary remarks about terrorist attacks in the United States, was Obama’s “Achilles’ heel” and “that’s why they decided to lie about it.” He then decried nonexistent double standards by saying, “Had this been a white Republican consorting with a [KKK] Grand Dragon,” the press would have covered that story more than they did Wright’s sermons. November 2, 2014: Carlson advocated for “an older white guy-appreciation day.” While discussing the 2014 midterm elections, Carlson noted that white men had “done a lot for this country,” speaking “as one of them.” Carlson advocated for “an older white guy-appreciation day,” naming penicillin as an example of their contributions. May 19, 2015: Carlson told conspiracy theorist Alex Jones that the Obama administration was pushing “Nazi” politics. During a guest appearance on The Alex Jones Show, Carlson told host and conspiracy theorist Alex Jones that the Obama administration was engaging in "Nazi stuff" by using ethnic politics. October 21, 2015: Carlson said that then-candidate Donald Trump is the “embodiment” of the “frustrations” of those who are labeled “racist” or “nativist” but have “legitimate” anti-immigration concerns. In an appearance on Courtside Entertainment Group’s The Laura Ingraham Show, Carlson defended then-candidate Donald Trump’s extreme anti-immigrant rhetoric, saying that if “legitimate” extreme anti-immigration views are not allowed “to be aired, they will pop up in some other place. They don't go away, they're not resolved.” He also said that the Republicans were lucky that Trump was all they got, and not a modern-day equivalent to segregationist 1960s Alabama governor and failed presidential candidate George Wallace. November 18, 2016: Carlson reflexively defended then-Attorney General nominee Jeff Sessions’ racist past. After then-Sen. Jeff Sessions was nominated to become Trump’s attorney general, Tucker told his guest that his concerns about Sessions’ record of racism was “fearmongering” and that he couldn’t be racist because Alabama is a “diverse” state. December 21, 2016: Carlson compared affirmative action to slavery, Jim Crow, and Japanese internment. February 10, 2017: Carlson complained that on college campuses “everybody gets a safe space except white men. They are hated and despised.” During his Fox show, Carlson interviewed then-Daily Caller columnist Scott Greer, author of the book No Campus for White Men, and claimed that creating safe spaces for marginalized groups demonstrates that “the hysteria level is rising.” The Daily Caller -- which Carlson co-founded -- fired Greer in 2018 after The Atlantic revealed his ties to white nationalists and members of the “alt-right” like Richard Spencer. March 13, 2017: Carlson hosted Congressman and white supremacist Steve King and defended him after King received backlash for a racist tweet. Rep. Steve King (R-IA) faced backlash when he tweeted in support of right-wing Dutch politician Geert Wilders, writing, “Wilders understands that culture and demographics are our destiny. We can’t restore our civilization with somebody else’s babies.” Carlson hosted King on his show to defend his racist remarks and said to him, “Everything you said, I think, is defensible and probably right.” Carlson again invited King on his show later in July to talk about his proposal of defunding Planned Parenthood to build a wall along the southern U.S. border. King has a history of elevating neo-Nazis and known white supremacists on Twitter, and he has cited the white nationalist publication VDare on his congressional website, . May 3, 2017: Carlson stated he was “pretty sympathetic” to the “alt-right,” anti-Semite troll known online as “Baked Alaska.” While interviewing Buzzfeed’s Ben Smith, Carlson said that he was “pretty sympathetic” to former Buzzfeed employee turned “alt-right” troll Tim Gionet, who is known online as “Baked Alaska.” After quitting Buzzfeed, Gionet claimed that Jews control the media, went on to participate in the 2017 “Unite the Right” white supremacist rally in Charlottesville, VA, and started a YouTube live stream show in which he hosted neo-Nazis and white supremacists. May 10, 2017: Carlson falsely claimed that a racist Texas voter ID law that several courts found to be discriminatory against minority voters had “nothing to do with race.” Carlson tried to defend the 2011 Texas voter ID law SB 14, claiming it had “nothing to do with race.”However, several courts found the law not only discriminated against minority voters but also was created with the “intent to discriminate against minority voters.” In 2016, a federal appeals court explained that under the law, Black voters would be “1.78 times more likely than Whites, and Latinos 2.42 times more likely, to lack” the ID required to vote. June 26, 2017: Carlson defended Trump’s Muslim ban by asserting “it doesn’t ban Muslims.” As Carlson’s guest explained, “The six countries that it banned, the only thing that they have in common is they are majority Muslim countries. July 17, 2017: Carlson used the slur “gypsies” and claimed that Roma immigrants have “little regard for either the law or public decency.” Carlson hyped reports that a group of Roma asylum seekers were settling in Pennsylvania and “integration is not going well” because “citizens say they defecate in public, chop the heads off chickens, leave trash everywhere, and more.” He complained, “This has been a distinct group for a thousand years that actually hasn’t assimilated, for the most part, into the cultures in which it’s been hosted.” The Roma, who Carlson referred to as “gypsies,” were a target of the Nazi ethnic cleansing project. September 5, 2017: Carlson went to bat for Gab, a social media site dubbed a “haven for white nationalists.” Carlson hosted Andrew Torba, the founder of Gab, a social media app that has been described as a “haven for white nationalists” and a “magnet for the alt-right.” Carlson defended the app and joined Torba in attacking Google and Apple for removing it for promoting “hate speech,” while conveniently ignoring the extremist content that proliferates on Gab. September 7, 2017: Carlson’s proposed solution to California’s overcrowded prisons was deportation. During a conversation about California’s mass incarceration system, Carlson repeatedly inquired “what percentage of its inmates are foreign nationals” and suggested deportation as a solution to overcrowding. September 20, 2017: Carlson lashed out after Rep. Maxine Waters (D-CA) linked former Chairman of Breitbart News Steve Bannon to racism. Carlson defended Breitbart News from accusations of racism by saying he reads it and knows “most people who work over there” and they aren’t “Klansmen.” Breitbart has a history of employing extremists, including former tech editor Milo Yiannopoulos, who used to run drafts of some Breitbart content by white nationalists for feedback. September 26, 2017: Carlson had a meltdown after a Black guest pointed out Carlson wouldn’t understand what it's like to be “brutalized” by police, accused him of playing “the victim card.” Carlson accused his guest Scott Bolden, a Black lawyer, of playing “the victim card” for talking about his personal experience with police brutality. Carlson also claimed that saying there are racially two Americas was “garbage”. October 20, 2017: Carlson dismissed Trump's birther conspiracy theories against Obama, claiming they weren't racist. Carlson claimed that Trump’s birther question was “factual,” not racist. October 31, 2017: Carlson baselessly characterized terrorism as something that “seems obviously tied to immigration.” Carlson asserted that immigration is fueling a rise in terrorism and questioned why the U.S. refuses to have a conversation about it. December 20, 2017: Carlson fearmongered that Democrats want "demographic replacement" with a "flood of illegals" to create "a flood of voters for them." Carlson accused Democrats of having no interest in using immigration to better the country but wanting to build their own political base by bringing in a “flood of illegals.” He framed immigration as “demographic replacement,” echoing a white nationalist slogan that perpetuates the baseless claim that there’s a “white genocide” underway. 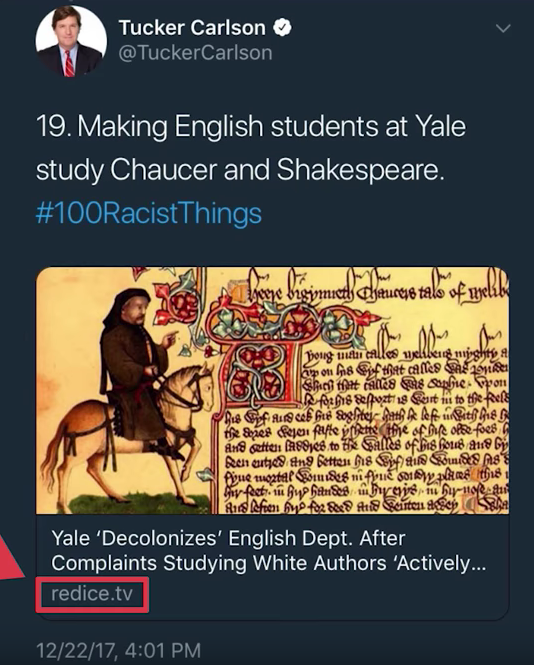 December 22, 2017: On Twitter, Carlson linked to explicitly racist YouTube channel Red Ice TV, then deleted the tweet. As end-of-year content, Carlson was tweeting out what appeared to be a tongue-in-cheek list of 100 things that had been called racist in 2017. For item 19, Carlson tweeted out a link to Red Ice TV, an explicitly racist media operation with a wide-reaching YouTube channel which hosts Holocaust deniers and criticizes interracial relationships. While Carlson deleted the tweet after some backlash, Red Ice TV relished in the attention and devoted a video to the incident. January 18, 2018: A guest on Tucker Carlson Tonight defended white supremacists and claimed that Hispanics in Arizona represent the end of American society. While appearing as a guest on Carlson’s show, Mark Steyn -- who has also filled in as a guest host for Carlson on multiple occasions -- opined that Democratic leaders prefer “illegal immigrants … over American citizens.” While claiming to advocate for defending the interests of American citizens, Steyn went on to dismiss the threat of race extremism by saying that “white supremacists are American citizens” while “illegal immigrants are people who shouldn't be here.” He closed his appearance by fearmongering about the “cultural transformation” brought on by immigration, criticizing Arizona for having a majority of Hispanic grade school children. Carlson seemed to agree with every statement. January 26, 2018: Carlson angrily denied that Trump's immigration plan is white nationalist while smearing non-white DACA recipients. Carlson took issue with criticisms that a Trump immigration proposal had white supremacist elements, saying that “it definitely isn’t a form of white nationalism” because it would “legalize about 2 million people who currently have no right to be here” who are non-white (referring to undocumented immigrants brought to the U.S. as children). February 7, 2018: Carlson slammed immigrants eligible for the protections under the DACA program for living in "a country that's not theirs." Carlson accused DACA-eligible immigrants “didn’t care about our law.” In reality, signing up for DACA actually involved several steps with legal costs that could go over $500. February 13, 2018: Carlson and guest Brit Hume discussed when it would be appropriate to use the N-word. Carlson and Hume agreed that an overwhelming “wave of political correctness” was silencing too much speech, including the ability to say the N-word in some contexts. Hume added that because “America is a compassionate country,” being a victim is “kind of a good deal” and therefore people “go around applying for victim status.” Carlson agreed with the statement. February 21, 2018: Carlson promoted Minds.com, a social media platform full of bigotry. Carlson hosted Bill Ottman, the co-founder of Minds.com, who claimed that tech giants were seeking to destroy his company by censoring his site. AdSense, Google’s advertising platform, was banning his site for its bigoted content that included Holocaust denialism, the celebration of swastikas, and racist memes. February 28, 2018: Carlson fearmongered that "foreign citizens will be electing our political leaders" if undocumented people were given access to basic ID cards. While shilling for voter ID laws (which disenfranchise minority and elderly voters), Carlson criticized Chicago for an initiative to provide IDs for undocumented immigrants. Carlson went on to describe the Democratic Party as “the party of foreign voters now, many of them illegal.” Studies have shown this is not a serious concern regarding election integrity. March 13, 2018: Carlson defended an extremist YouTuber after she was barred from entering the U.K. Carlson defended American extremist YouTuber Brittany Pettibone and her “identitarian” boyfriend Martin Sellner -- who wants to preserve “ethno cultural identity” in Europe -- after the U.K. authorities refused them entry in the country, citing their “planned activities” that would “bear a serious threat to the fundamental interests of society.” Carlson attacked the U.K., framing the refusal as evidence that it was a country that “hates itself, its heritage, and its own people.” Pettibone, a well-known “alt-right” troll, has appeared on white supremacist YouTube channel Red Ice TV, and has pushed conspiracy theories like “white genocide” and “Pizzagate,” according to Right Wing Watch. March 27, 2018: Carlson repeatedly berated an undocumented guest about whether he planned to vote in the next election. While hosting lawyer Cesar Vargas to discuss whether the U.S. 2020 census should include a question about people’s immigration status, Carlson latched unto Vargas’ undocumented immigration status to repeatedly ask him whether he was planning to vote in the next election. April 2, 2018: Regular guest Mark Steyn promoted a “stunningly racist” anti-immigrant French novel on Carlson’s show. While appearing as a guest on Tucker Carlson Tonight, Mark Steyn, who frequently guests hosts the show when Tucker is out, praised Jaen Raspail’s The Camp of the Saints, a novel that has been accurately described as “a favorite racist fantasy of the anti-immigrant movement” and “revered by white supremacists.” Steyn had previously cited the novel in a prior appearance on Fox News, when he asked if The Camp of the Saints was “playing out simply incrementally with smaller boats” across Europe. April 27, 2018: Carlson dismissed guest’s explanation that some Mexican immigrants come to the U.S. fleeing violence by saying that if Mexico is "such a dangerous country filled with so many violent people, why would we let any of them into our country?" While hosting Univision’s Enrique Acevedo, Carlson asked him why Americans wouldn’t “be terrified” to “let [Mexicans] in” the United States, after Acevedo cited safety as one of the reasons Mexican immigrants flee their country. May 15, 2018: Carlson hosted an apartheid apologist to fearmonger about South African land reform. Carlson provided a platform to Ernst Roets, a leader of AfriForum, a group that has referred to apartheid as a “so-called” injustice. Despite a lack of evidence that attacks on white South African farmers are racially motivated, Carlson painted a picture of imagined white persecution by inaccurately reporting that a law had been passed allowing South African authorities to seize lands from white owners with no compensation for redistribution. 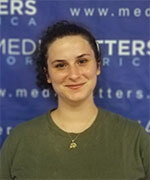 Carlson lectured that the situation "is not what Nelson Mandela wanted." May 16, 2018: Carlson begged his guest to say something racist. While criticizing a University of Colorado graduate certificate program in diversity and social justice that offered students credit if they held “witnessing whiteness workshop” in their hometowns, Carlson called on his guest “to be honest and make a negative generalization about any other racial or ethnic group” besides white people. July 16, 2018: Carlson downplayed Russian election interference by claiming Mexico is "routinely interfering in our elections by packing the electorate" through immigration. July 24, 2018: Carlson characterized "hate speech" as "a made-up category designed to gut the First Amendment and shut you up." Carlson also mocked an anti-Nazi poem written after the Holocaust. July 26, 2018: Carlson accused immigration advocates of objecting to hateful rhetoric against immigrants because "you're attacking their housekeeper." Carlson also characterized immigrants as a “serf class” imported to serve immigration advocates. July 30, 2018: Carlson suggested a permanent resident guest he assumed was undocumented was lucky he wasn’t having him taken out by force for criticizing the immigration system. Carlson attempted to shut down his guest Cesar Vargas, a previously undocumented lawyer, by saying, “Don’t hit me with the race crap.” He then tried to dismiss Vargas’ arguments by claiming he’s from a country “controlled by the conquistadors.” Carlson also said that Vargas had some chutzpah by “sitting here illegally and we’re not reporting you or having you like, taken out by force,” a point at which Vargas had to explain he in fact was a green card holder. August 14, 2018: Carlson attacked refugees for using food assistance and took issue with recognizing children of undocumented immigrants born in the U.S. as U.S. citizens. Citing a study by the anti-immigrant hate group Center for Immigration Studies, Carlson said refugees are “living off of taxpayers largesse.” Then, complaining that undocumented immigrants who have children in the U.S. can get government aid for their American children, Carlson suggested that it “might not be the case” that birthright citizenship is mandated by the Constitution. August 22, 2018: Carlson used white nationalist talking points to again fearmonger about “race-based land seizures” in South Africa. Carlson described land reform in South Africa -- a program to redistribute unequal land ownership that is a legacy of apartheid -- as “literally the definition of racism.” He neglected to mention that the lands had been forcefully taken from Black South Africans during apartheid. Trump tweeted in response to the segment that he would be directing Secretary of State Mike Pompeo to look into the matters. White supremacists celebrated the segment and Trump’s tweet, as they have long taken South African politics out of context to serve their narrative of white oppression..
September 7, 2018: Carlson attacked American diversity, saying that it made “marriage or military units” less cohesive. In a racist monologue that echoed white nationalist talking points attacking the value of diversity in American society, Tucker pitted “diversity” and “freedom of speech” against each other and claimed “racial discrimination” against white people is “acceptable” and “encouraged” in today’s society. After the segment prompted widespread criticism, Carlson attempted a defense on Twitter. White supremacists online celebrated the segment and agreed with Carlson. September 18, 2018: Carlson claimed that Democrats’ willingness to hear sexual misconduct reports against then-nominee to Supreme Court Brett Kavanaugh was equivalent to sexism and racism. While dismissing the sexual misconduct reports against Kavanaugh, Carlson portrayed those willing to hear Christine Blasey Ford -- who said a drunken Kavanaugh sexually assaulted her when they were in high school -- as blaming all men, “every single one of them, because they are men.” He then equated the willingness to believe women’s testimonies of sexual assault with blaming all men, suggesting it was similar to racism. October 1, 2018: Carlson warned his audience about threats of white “genocide.” Carlson claimed that a professor’s angry tweet about Kavanaugh and Sen. Lindsey Graham (R-SC) that had received considerable attention from white nationalists was really about “genocide.” The conspiracy theory that “white genocide” is afoot is a common trope of white supremacists. October 15, 2018: Carlson laughed at the mention of immigrant “babies in cages” as his guest brought up Trump’s family separation policies. As Carlson’s guest Richard Goodstein, a former adviser of Hillary Clinton, referenced Trump’s family separation policies by stating the administration had a history of “locking up babies in cages,” Carlson minimized the inhumane policy by openly laughing. December 5, 2018: Carlson claims California was a “middle-class paradise” until “low-skilled immigration overwhelmed” the state. Carlson claimed that the source of policy problems in California “is pretty simple -- low-skilled immigration overwhelmed” the state. He said, “A hundred years ago, immigrants came to California for opportunity, and now they come for the benefits.” He also attacked immigrants working in Silicon Valley’s tech sector. 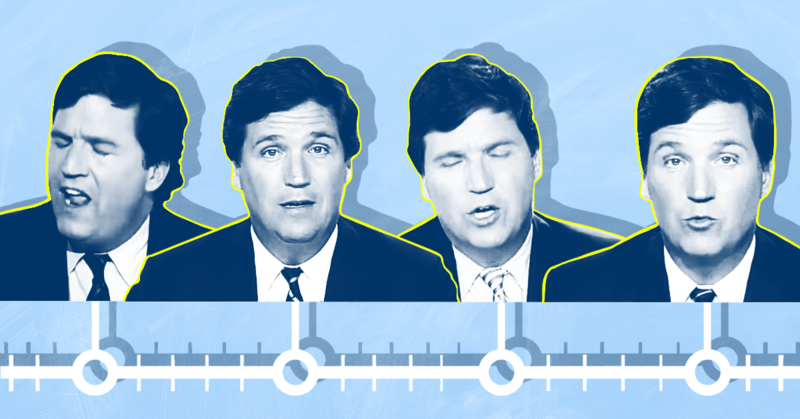 December 13, 2018: Carlson says immigration makes America “poorer, and dirtier, and more divided.” He claimed “our leaders demand that you shut up and accept” immigration “even if it makes our own country poorer, and dirtier, and more divided.” More than 24 advertisers have left Carlson’s show following this comment. January 9, 2019: Carlson attacks corporate diversity policies as “racial discrimination” and calls for a Justice Department crackdown. He chastised the Justice Department for not using civil rights laws to prosecute corporations using pro-diversity policies and invoked Alex Jones as an example of a victim of discrimination on tech platforms. This post was originally posted on October 28, 2018; it was last updated on January 30, 2019.